UDM Downloads > abc X DVD Audio Ripper! abc X DVD Audio Ripper is an up to date DVD audio ripper and DVD audio extractor which provides a simple, fast method to rip DVD audio to WAV, rip DVD to MP3 format. 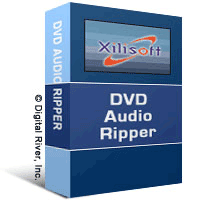 Using DVD Audio Ripper, users are allowed to rip DVD audio tracks with ease. No more multiple programs, no more complex progress. The software product is an ideal solution of ripping music DVD, old movie and concert DVD to mp3. Listen to your favorite movies from now on! DVD Audio extractor, rip DVD to MP3, convert DVD to WAV format; Supports ripping by chapters, custom time or custom file size; You can rip a clip by specifying beginning and ending time; Output audio quality is adjustable from 80 Kbits to 320 Kbits when ripping to MP3; You can edit ID3 tag for your DVD sound with Xilisoft DVD Audio Ripper; Allows you to select a language or audio track when ripping multi-language DVDs.